Keep your trampoline secured safely and sturdy into the ground during harsh weathers and strong winds! These are Extremely High Quality, UV treated Anchors for lasting weather protection. Sturdy design that screws into the ground for extra security. 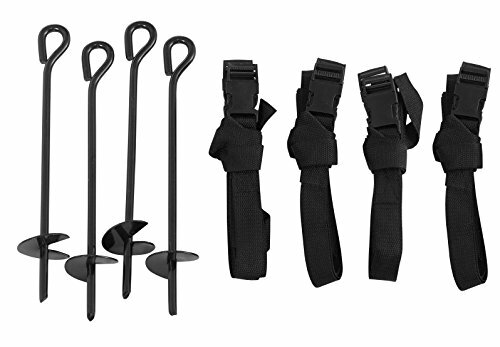 Easy to assemble, with 8 Buckles & 4 Straps that go over the Top & Bottom, of your Trampoline Frame. This Kit can be used for all brands of Trampolines & other outdoor items that need to be anchored down.